This article originally was published in The Harvard Gazette, March 29, 2018. The extinction of our swimming, trotting, slithering, and flying companions on Earth is a building global disaster on a par with climate change, but one that has a solution, according to noted biologist Edward O. Wilson. Wilson, Harvard’s Pellegrino University Professor emeritus, says that setting aside half of the Earth’s land and half of its oceans would be enough to save 85 percent of species, which are becoming extinct at a rate between 100 and 1,000 times the rate before humans. Wilson, who spoke at the Harvard Kennedy School’s (HKS) John F. Kennedy Jr. Forum on Wednesday, acknowledged that setting aside that much land would be no easy feat. He also said it couldn’t just be any land, but would need to have key features, such as high biodiversity, and land corridors to protect ages-old migration routes and connect preserves, parks, and other places set aside for wildlife. Wilson made his comments during a panel discussion, “Climate Change, Biodiversity, and the Future of Conservation in America,” that also included Jonathan Jarvis, director of the National Park Service during the Obama administration. 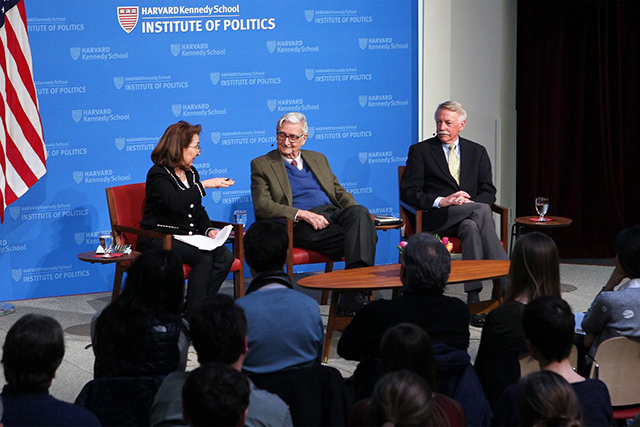 The event was moderated by HKS’s Linda Bilmes, the Daniel Patrick Moynihan Senior Lecturer in Public Policy and a member of the National Park Service Advisory Board. Though Jarvis agreed such a massive task would be difficult, he also said that the current U.S. administration’s negative stance on the environment has created an opportunity to mobilize public support and make common cause among groups concerned about other policy areas, such as women’s rights, support for science, gun control, and immigration issues. Jarvis said that just 12 percent of U.S. land currently has some sort of conservation status, but he highlighted efforts underway to collaboratively manage lands, as in the Northern Rocky Mountains, to keep it and the creatures there healthy. Another example is the work to conserve a Wyoming wildlife corridor called the Path of the Pronghorn, a 200-mile migration route, parts of which are threatened by development, used by pronghorn antelope during their annual migrations. Further, Jarvis said, conservation land doesn’t necessarily mean land entirely free of human impact. While he and Wilson agreed that some wildlands and ocean preserves should be maintained without human intrusion, many places can support some level of human activity. When considering the conservation status of an area, Jarvis said an effective initial step is to talk with the people using that land, particularly if they depend on it for their livelihoods. An eventual conservation plan should take their concerns into account, he said, and, though a vocal, anti-conservation core may remain opposed, most objections fade over time. Both Jarvis and Wilson traced the fondness for wild places back to humanity’s deep roots and millennia spent living outdoors. That life instilled in people a deep appreciation for nature, which Wilson called “the love of the home that one forms in the natural world.” It has only been in recent generations that people have “come inside,” Jarvis said, and a core part of many people retains that appreciation for nature. “I can take any individual … to the rim of the Grand Canyon or to the High Sierras to see the Milky Way or to stand beneath the giant sequoias and they are moved,” Jarvis said. Aiding efforts, Jarvis said, is that the health benefits of nature are becoming recognized to the extent that doctors are prescribing that people walk outside. In response to a question from the audience about how to boost the acreage of wild places, Wilson said people can help even when selecting plants for landscaping by choosing native species instead of exotic ornamentals, which not only can be harmful when their seeds spread into the environment, but also sometimes offer no sustenance for native insects, on which birds and other animals depend. And, though preservation of large, wild places is important in any conservation scheme, the increasingly urban population’s love of the outdoors can be fed by ensuring neighborhoods have parks and other green spaces. National parks, Jarvis said, should be managed for the whole population, not just for the middle and wealthy classes. That’s why, he said, a proposed hike in park entry fees is a bad idea. When asked how the next generation can help, Jarvis suggested that young people vote for conservation-minded leaders and run for office themselves. Wilson said an enormous amount of work remains to categorize and understand life on Earth, work that will inform which lands and ocean areas are most critical to preserve. Though 2 million species have been identified so far, scientists estimate another 8 million remain to be described, Wilson said, so there is plenty of work for the next generation of biologists.